Sea kayaking can be a relaxing, peaceful paddle on a gloriously sunny day, observing the myriad of coastal wildlife around our shores. For me however, sea kayaking is an extreme sport which at best takes place in a tidal race. A tidal race occurs when huge quantities of sea water move with the rising or falling tide through a constriction. This narrowing can occur between two landmasses such as islands or large rocks. It can just as easily arise from beneath, as a shelf or reef on the sea bed pushes water upwards. If a large volume of water is suddenly pushed through a narrow gap, it has no choice but to speed up. With speed comes turbulence, standing waves and a great deal of extreme, but potentially dangerous, fun for the sea kayaker. Indeed, speeds of up to 17 knots have been recorded in one tidal race off Vancouver Island in Canada. The long thin, narrow design of a sea kayak enables it to be paddled against the tidal race current. As water is pushed up from the sea bed, standing waves form. These can also travel against the current. If the sea kayaker can catch one of these waves and surf it, the kayaker can be propelled against the tide at speed. 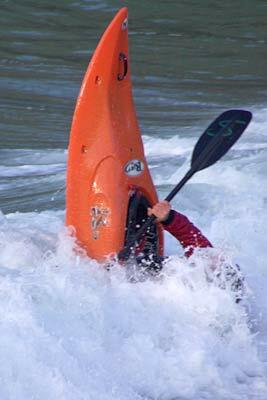 The surf wave pushes the stern of the kayak upward and forward, tipping it upstream. Often, in relation to the land the kayaker is hardly moving. But with the torrent of white water flashing by at 5 to 10 knots the illusion of speed and hence the thrill of the ride, is intense. Beware however, tidal races are dangerous in inexperienced hands. Large standing waves and whirlpools can appear and disappear seemingly at random. They can tip over a kayak, and the oxygen rich white water can make rolling back up challenging. Kayakers can even be sucked from their boats and taken deep under water by the whirlpool vortices that can arise. Get it right however, and the experience can be addictive. As you feel the back of your boat lift, the bow starts to bury. The tapping sound of the bow toggle against the hull is the first clue as to what's about to happen. The kayak becomes more and more vertical as the sea rushes by. If the wave is steep it can push you right over. Lean back or high brace to the side to stop it or, alternatively, accept the inevitable dunking into the sea, and role back up. You can read more about tidal races around the Isle of Man at www.KAYAK.im .